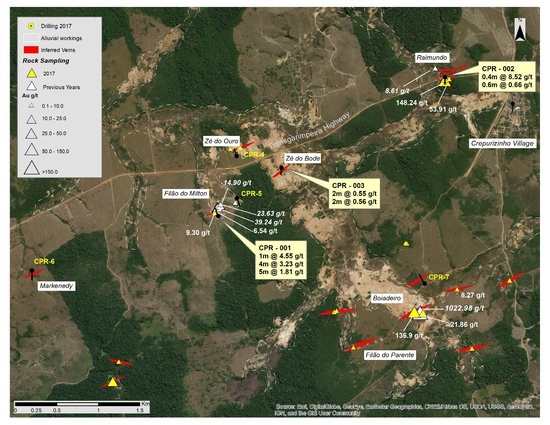 The 100% owned Crepori project is located in southern Para state in Northern Brazil and has been the focus for significant but small scale historic placer Gold production which is estimated to have been in the order of at least 0.5Moz. The area has never been previously drilled with a view to identifying the source of this gold. With this objective in mind, Altamira drilled a total of 7 holes for 876m at Crepori during November and December 2017. Holes were located in six separate areas where high grade veins had been mapped on surface but surface exposures in the area are sparse with +99% of the area being covered by recent soils. Hole CPR-1 was drilled below an area of historic workings on a sheeted vein zone at the Ze Milton target with surface grab samples returning ranges of 6.54 - 39.24g/t gold. Hole CPR-1 returned 1m @ 4.55g/t gold from 79-80m, 4m @ 3.23g/t gold from 98-102m and 5m @ 1.81g/t gold from 104-109m. The grades and widths encountered in this first hole at Ze Milton are considered very encouraging and require further drilling and follow up. Hole CPR-2 was drilled below a surface showing at the Raimundo target, which previously returned values of 8.61 - 148.24 g/t gold from surface grab samples. Hole CPR-2 returned 0.4m @ 8.52g/t gold from 34.8 - 35.2m and a second lower grade structure further down the hole which returned 0.6m @ 0.66g/t gold from 84.4 - 85.0m depth. Hole CPR-3 was drilled below a surface showing at the Ze do Bode target and returned 2m @ 0.55g/t gold from 35 - 37m and 2m @ 0.56g/t gold from 51 - 53m depth. No significant results were returned from Holes CPR-4 to CPR-7. The bulk of the placer gold previously mined from the area was mined upstream from the Ze Milton and Ze de Bode targets in an area with virtually no outcrop and will be the focus of further work aimed at identifying the bulk of the placer gold previously mined from the Crepori area. Commenting on these results, Mike Bennett, President & CEO stated "the results of the first phase drill program at Crepori were mixed. Whilst we are encouraged by the presence of significant mineralization in the Ze Milton area, the bulk of the alluvial gold mined from surface at Crepori and estimated to have been in the order of 0.5Moz, remains unexplained. Further drilling will be required in order to identify the hard rock source of the alluvial gold, but in view of the recent discoveries in the Baldo East area at Cajueiro, additional drilling at Crepori will be a secondary priority". The Company is focused on the exploration and development of gold deposits within western central Brazil. The Company holds 12 projects comprising approximately 200,000 hectares, within the prolific Juruena gold belt which historically produced an estimated 7 to 10Moz of placer gold. The Company's advanced Cajueiro project has an NI 43-101 compliant resources of 8.64Mt @ 0.78 g/t Au (for 214,000oz) in the Indicated Resource category and 9.53Mt @ 0.66 g/t Au (for 204,000oz) in the Inferred Resource category and an additional 1.37Mt @ 1.61 g/t Au in oxides (for 79,000oz in saprolite) in the Inferred Resource category. Statements in this document which are not purely historical are forward-looking statements, including any statements regarding beliefs, plans, expectations or intentions regarding the future. It is important to note that actual outcomes and the Company's actual results could differ materially from those in such forward-looking statements. Except as required by law, we do not undertake to update these forward-looking statements.